We always have Wick-It Cool Candles burning around the house! They have so many great scents and they work as a warm massage oil too! 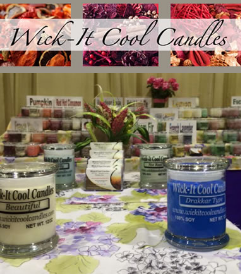 Wick-It Cool Candles makes eco-friendly soy candles that burn cleaner, cooler and longer than candles created with other wax. Wick-It uses lead-free cotton wicks and recyclable glass jars. These candles are great as gifts for family and friends! Check out these awesome fall and Christmas scents!